New dates are added regularly. If you want us to let you about new classes subscribe to be notified. We know you are busy, just as we are, and promise our communications are infrequent! PRE-REGISTRATION & Payment is required for all events – click here to reserve your spot. Discover yoga in a fun way in an intimate and supported environment during this 6-week Yoga for Beginner Series. We will explore the background of yoga, and learn and practice the fundamental postures, their modifications, and the use of props to create greater stability and openness. You will also learn breathing techniques, meditation and yoga etiquette. 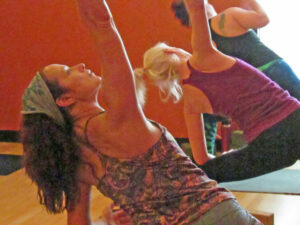 At the end of the course you will feel confident attending any mixed-level yoga class. We kick off with a 2 ½ hour Yoga for Beginners workshop session followed by 5 mixed level classes where you will learn how to work on your level in any class. → Entries close on April 30 and payments must be received by this date. Solo or bringing a friend? This 6-week Yoga for Beginners workshop and series is offered at regular intervals throughout the year. SUBSCRIBE here to be notified. SPECIAL OFFER: New clients registered for the full course are eligible for a 10% discount off Class Packages if you join before the end of the 6-week course. Your package will activate on the first day that you attend any regular class at the end of the series. You must preregister and pay in advance to attend. You can choose to purchase either a 5-class or 10-class package. Sign up here and purchase your classes here! Workshops can be paid for by cash, check, or SCROLL DOWN to the bottom of the page to pay online for these classes using PayPal. Yoga Nidra is a state of mind between wakefulness and dream state that opens deep phases of the mind. The practice includes eight stages: Internalization, Sankalpa (heart-felt resolve/vow), Rotation of Consciousness, Breath Awareness, Manifestation of Opposites, Creative Visualization, Sankalpa (repeated), and Externalization. We start with a gentle asana practice and then come into Savasana for 40-50 minutes for a guided practice of Yoga Nidra. Please reserve and pay in advance for this 90-minute class. You need a blanket, a small pillow and an eye pillow. We have eye-pillows with removable/washable covers for sale at $9:00. In this Forrest yoga class, you’ll work to strip away the layers of emotional and physical blocks held in the neck, shoulders, and upper back. You will learn how to let go of these habitual tension spots that show up as tightness and restriction in your neck, shoulders, and jaw, using the breath in conjunction with unique asana that creates freedom and strength these areas. This Forrest Yoga workshop teaches us to honor and celebrate ourselves exactly as we are in our life, body, and practice. The intent is to bring forth tools to heal, strengthen, and awaken to the magic within our own mystery that helps you walk through life with grace and freedom. This class includes inversions, standing poses, and vinyasa, and is heated to 85-degrees F. Suitable for all levels, including enthusiastic beginners. Experience the magic of heart-opening yoga asana. Learn how to remove obstructive shielding from your heart and make room for the gratitude that comes from seeing the beauty and sweetness in our world, nourishing your heart. This Forrest Yoga Workshop uses breath and asana, including deep hip-opening and restorative backbends, to open your physical body and uncover the self-worth, courage, and compassion that is a part of who you are. Delight in your strength as you work through this hot and sweaty class, expanding the possibilities of what you can achieve in your life. This class includes sun salutations, standing poses, forearm balances, twists, and hip openers. Forrest Yoga teaches us to honor and celebrate ourselves exactly as we are in our lives, body, and practice. The intent is to bring forth tools to heal, strengthen, and to awaken the magic within. Explore the proper and safe alignment of the body for each of the poses making up the Vinyasa sequence – plank, low pushup, upward facing dog, and downward facing dog – and how to link these poses using Ujjayi breathing. You will discover how correct alignment of the body creates power and stability in the poses. Modifications will be shown for injury, building strength, and pregnancy. Discover the magic of heart-opening yoga postures. Learn to remove shielding from your heart and make room for the gratitude that comes from seeing the beauty in our lives that nourishes our heart. This Forrest yoga workshop will help you to begin to release years and years of tension held in the neck, shoulders and hips, using breath and movement, including deep hip opening and healing backbends, to open up your physical body and un-shield your heart. Taught by Forrest Yoga teacher, Charmaine van Niekerk, at Life’s a Gift Yoga Studio, Sugar Land TX. You can purchase workshops here using PayPal. Member prices are discounted and include anyone with a current class pass!